Our Poesy Bracelets borrow the Poesy inscription from our ring collections and bring them to your wrist as wonderful layering pieces. We took the 500-year-old idea of the poesy ring inscriptions, made it modern and added this bracelet collection to our poesy styles. 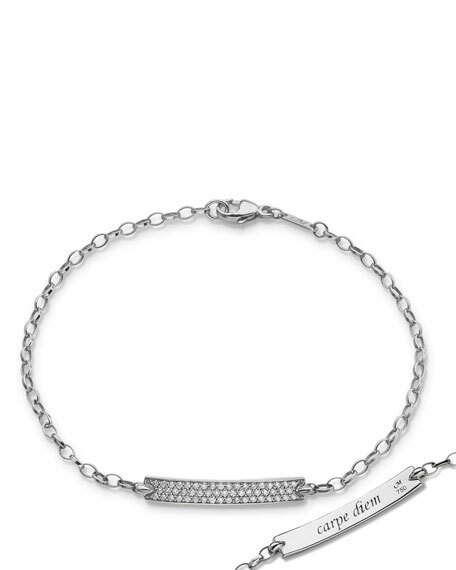 Monica Rich Kosann "Petite Poesy" bracelet. ID bar station with diamond micro-pavé. "Carpe Diem" engraved on underside. 0.23 total diamond carat weight. For in-store inquiries, use sku #2692284.